Everything is so fresh this morning after the rain of the weekend. The Birch is sending forth it’s new soft leaves. This tree, which can be seen from our kitchen window is one of my favourite trees. It is a tree said to have a particular affinity with women. 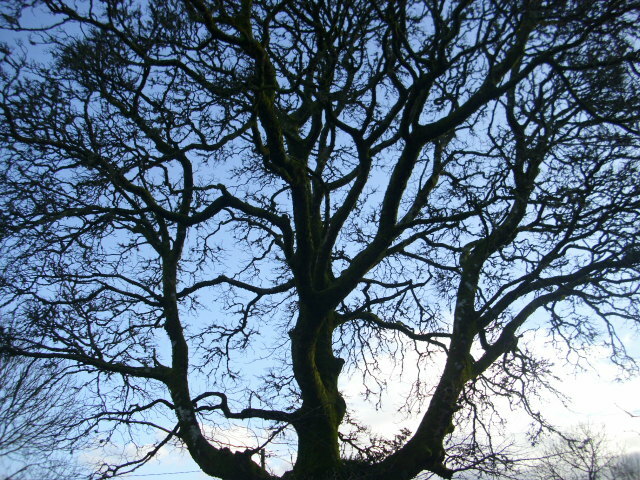 It’s slender white trunk and graceful branches which allow light to filter softly through have earned it the title “Lady of the Woods.” The leaves are edible… having diuretic and antiseptic properties… they are considered a Spring tonic… as is the sap which needs to be drawn before the buds break. 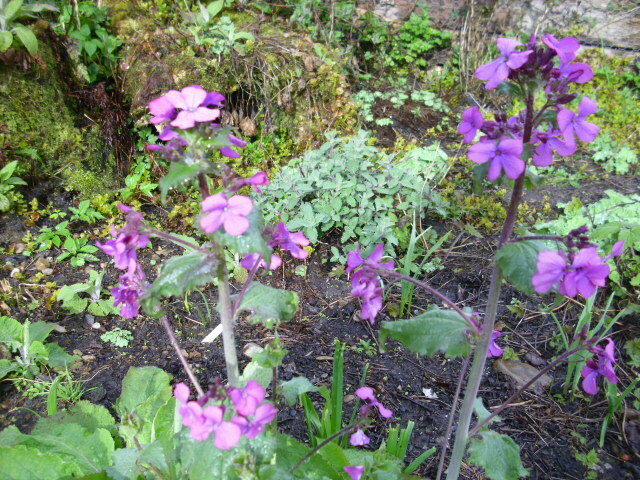 Honesty or Lunaria is flowering at the moment…like many things this year it is a little early. I love Purple flowers so this is a welcome relief from the predominant yellows of the moment. I often wonder if people see colours differently? I sometimes say to Andy “look at that, I just love that purple,” he will say “that’s not purple, it’s blue.” I know purple and blue are close together in the colour spectrum but to me they are vastly different. I find blue to be a cold colour while purple is, to me, a warm enlivining colour. Going into the garden it seems the Victoria Plum is having a rest this year. It should be flowering now. It has given around 40 lbs of fruit each year for the last 5 years so it is entitled to a break. As if to compensate both of the Damson trees are flowering for the first time. There are lots of Comfrey plants all around the garden. Such a useful plant! 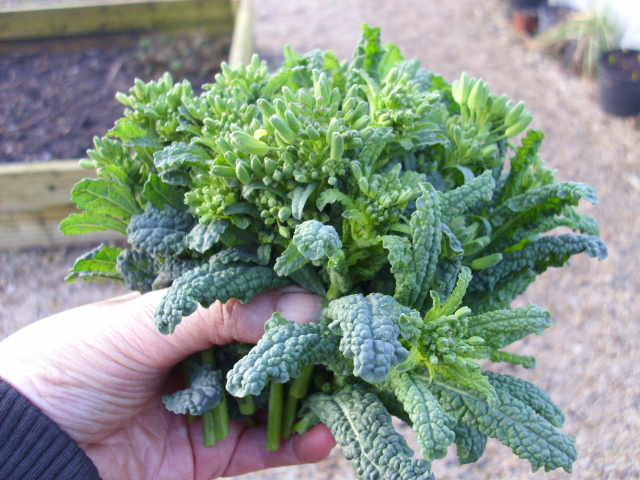 Mixed with Nettles it makes a wonderful organic fertiliser for all growing things. The smell is rank so leave it in an out of the way spot. Comfrey has a very long taproot so it is a great accululator of minerals from deep in the earth. 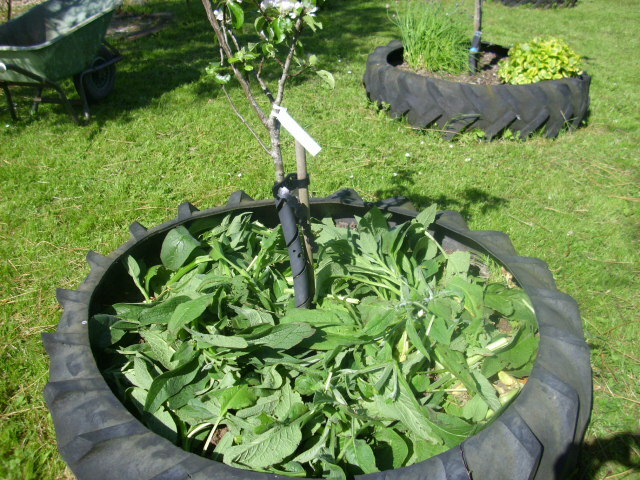 This are made available in the fast growing leaves which can also be used as a mulch around plants. 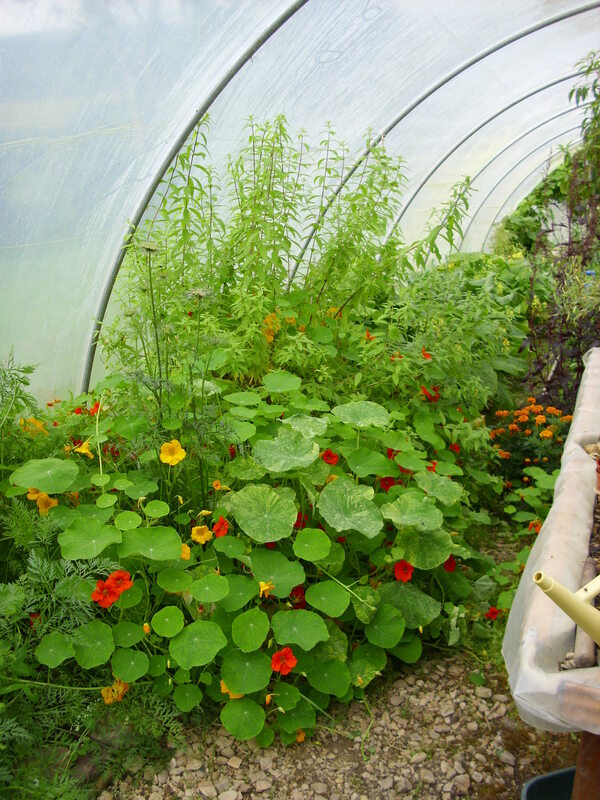 This is a permaculture technique called “crop and drop.” Four to five cuts a year can be taken. Comfrey also has medicinal uses. The name “knitbone” gives a clue to one of it’s uses. A poultice of the leaves is said to help broken bones heal easier and stimulate cell growth and repair. 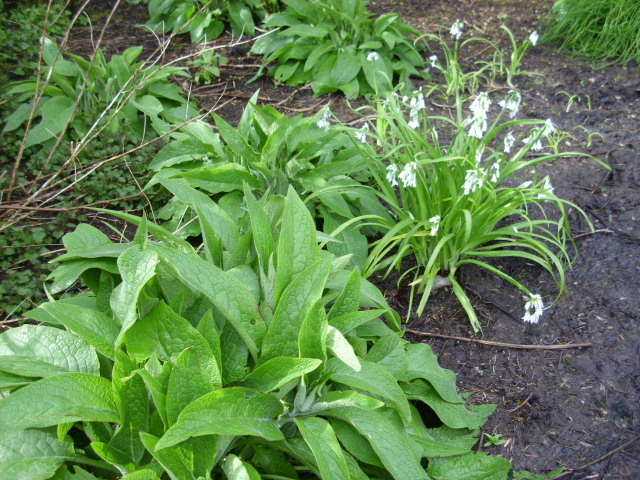 It can also be used internally, but caution is needed as there are reports of Comfrey causing liver damage. 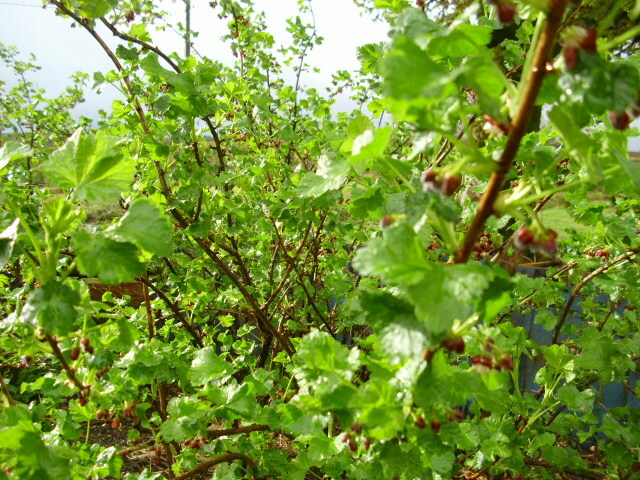 Jostaberries are promising a good crop this year…if we get them before the blackbirds! Even the outdoor herbs have put on a lot of growth already this year. 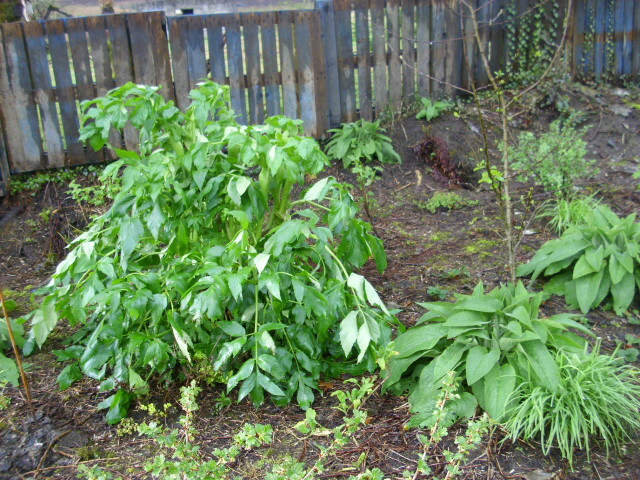 The Lovage is a little bit weighed down by all the rain at the moment but it is huge compared to this time in previous years. 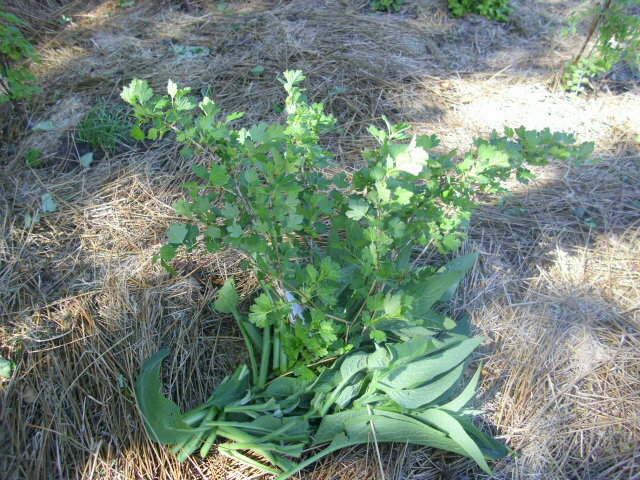 It is flanked by more Comfrey, Chives, Gooseberry and a young Crab Apple tree in this 3 year old forest garden area. Lovage makes a good substitute for Celery and in my view easier to grow. I’ve not had much success with growing Celery. I much prefer the perennial plant that returns each year. I always have wastage from Celery anyway. I buy a head…use a few stems for cooking… then it gets shoved to the back of the fridge to be discovered a few weeks later as a sad, floppy item destined for the compost. So not totally wasted I suppose but from now on it’s Lovage for me. Fresh and tasty direct from the good Earth. 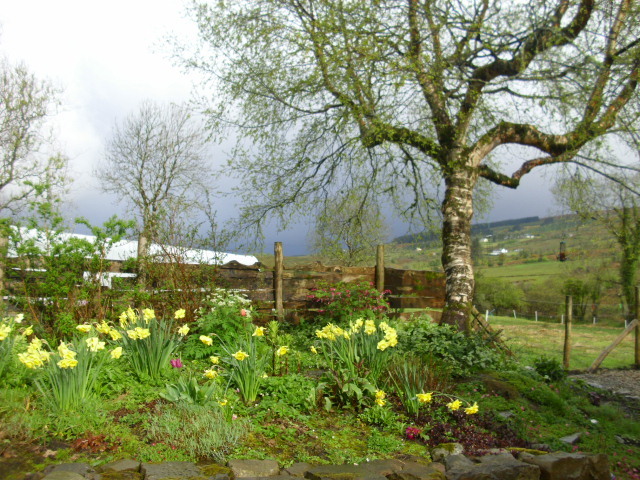 Weekend musings from a country smallholding. Bella is looking rather rock-chick with her new studded collar, don’t ya think? The blond stripe down her back is natural, I did’nt bleach it!! Hmm, could gel it and give her a mohican!! Agghhh! 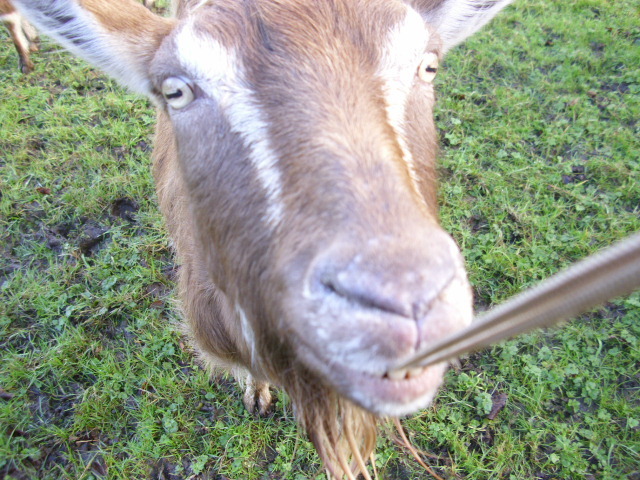 Enid tries to eat the camera strap as I’m taking the pics! 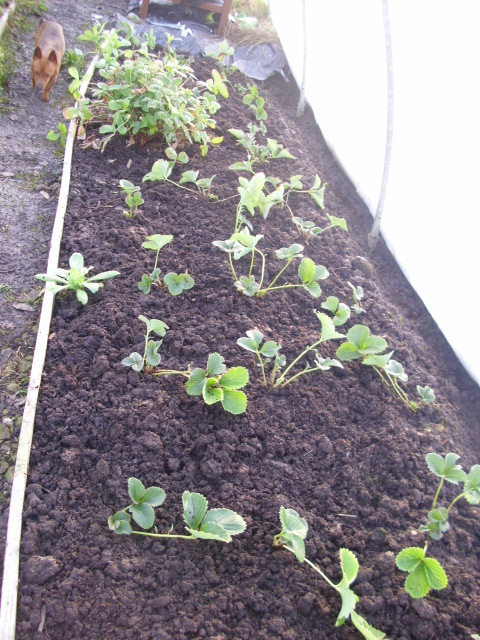 The Strawberries have been transplanted into their new bed in the small polytunnel. Dug in lots of manure so hoping for a good Strawberry harvest. 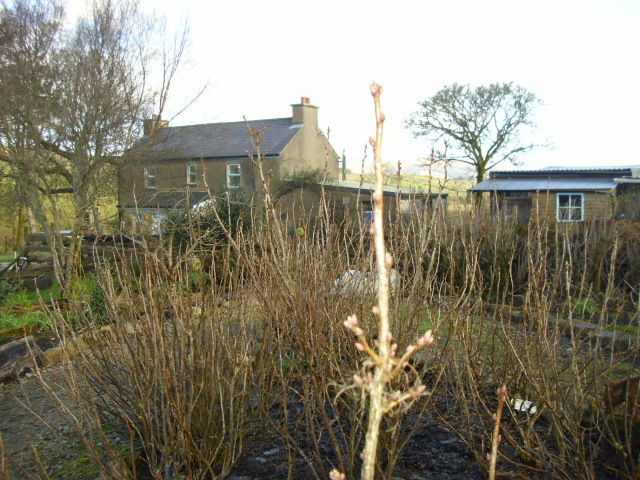 In the garden the Blackcurrants are already budding. They always do well regardless of weather, they seem to like the heavy soil here . 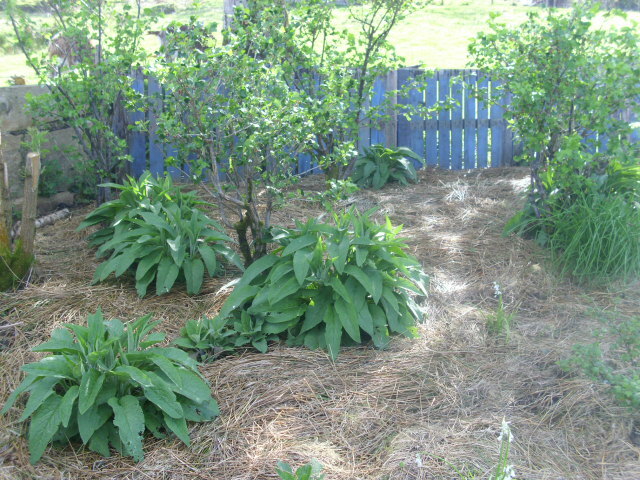 They are mulched with Comfrey a few times during the year. There was several hours of sunshine today. I spent some time in the garden, it was bliss just listening to the birds singing in the big Sycamore tree that overlooks the garden. There’s loads of seed heads on the Kale right now. Delicious raw or steamed. This evening we are having them steamed with Basmati rice and Red Lentil Dhal, accompanied by a good helping of Hot Plum Chutney. 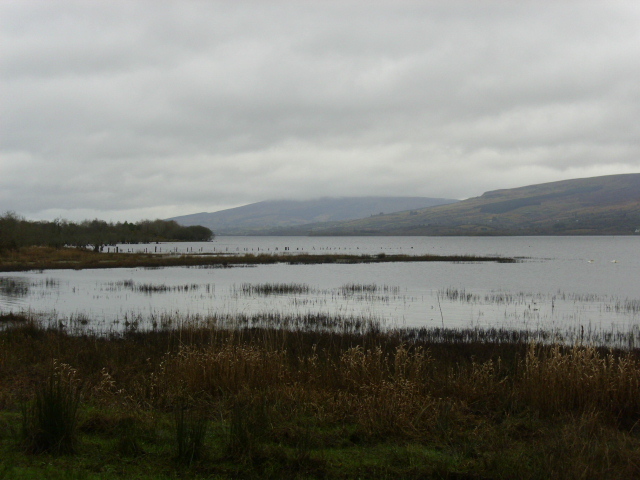 Walking by Lough Allen in the evening, the cloud is rolling in and everything is so quiet and still. Just how I like it! I never understood people who go about with headphones in. It’s like they can’t cope with their own thoughts, always got to have some distraction going on. Not for me!! Thursday Musings from Prospect Cottage. 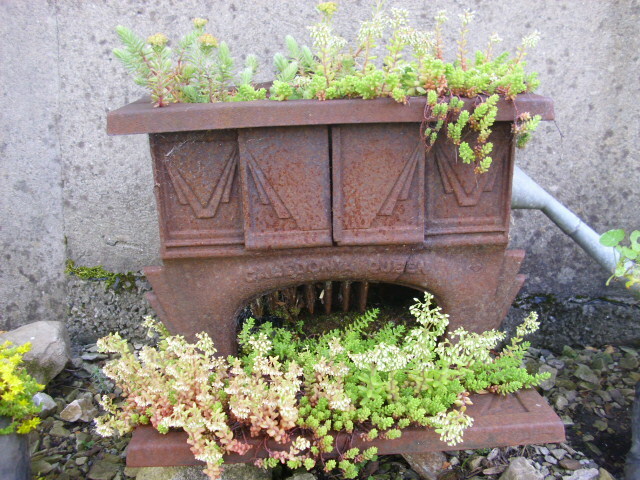 For Diana of Elephant’s Eye blog: a front facing pic of the old Quennie stove planted with succulents. Sorry pic is a bit wonky! Harvested the first onions yesterday. 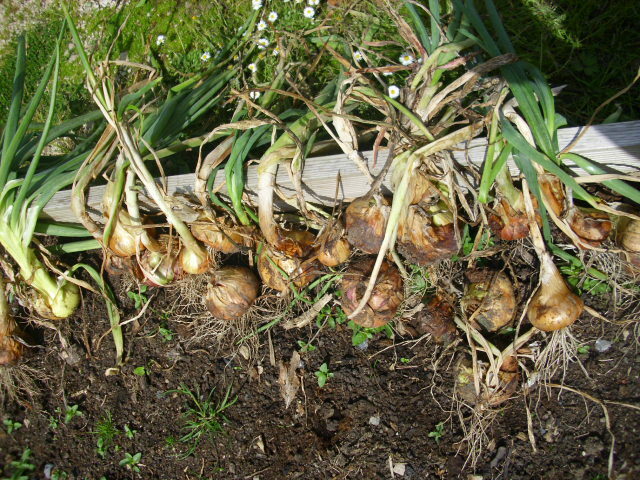 These were from sets planted in Spring in polytunnel which were for use as spring onions. We did’nt however use them all so they grew to full size. We use lots of onions in cooking so these won’t last long. 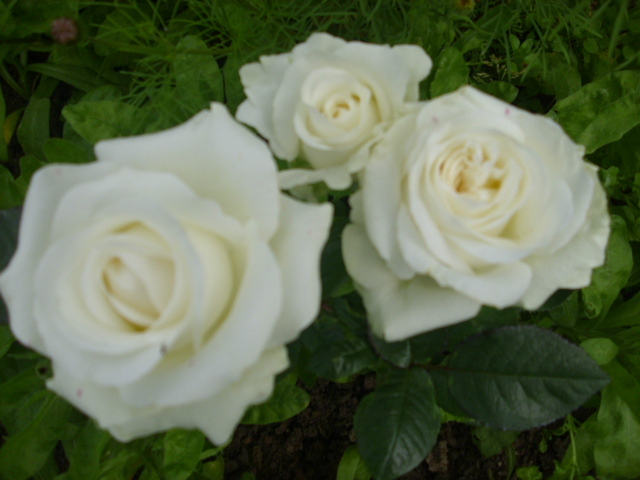 These perfect white Roses are on a plant grown from a cutting by my Mother. 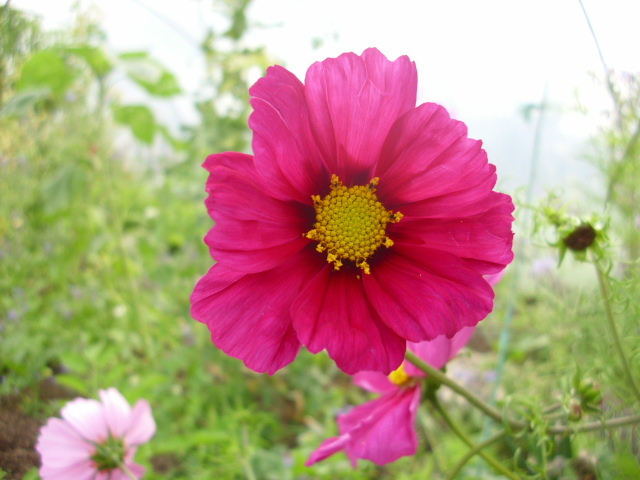 Cosmos have been flowering for a while now. They are in every shade of pink, this darker colour is my fave. 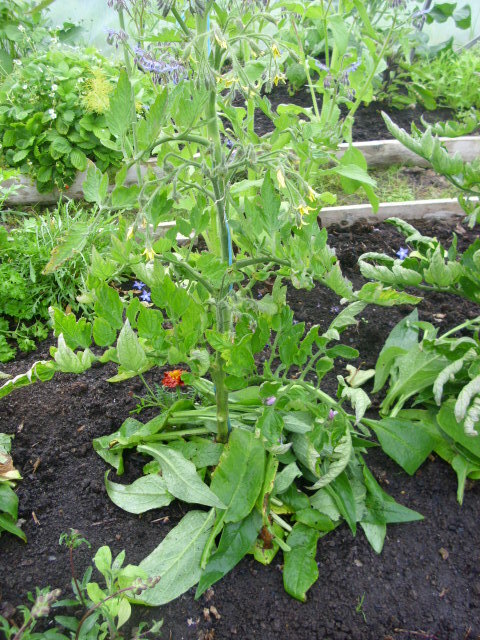 In the small polytunnel the Tomatoes have been mulched with Comfrey. This will rot down over time and give the plants an extra boost of nutrients. 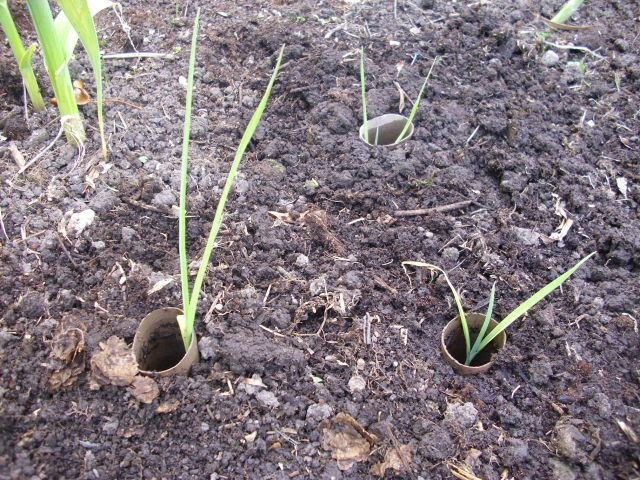 Leeks have been planted in the beds outdoors. I save the loo roll holders to stop the soil from falling in on the plants. 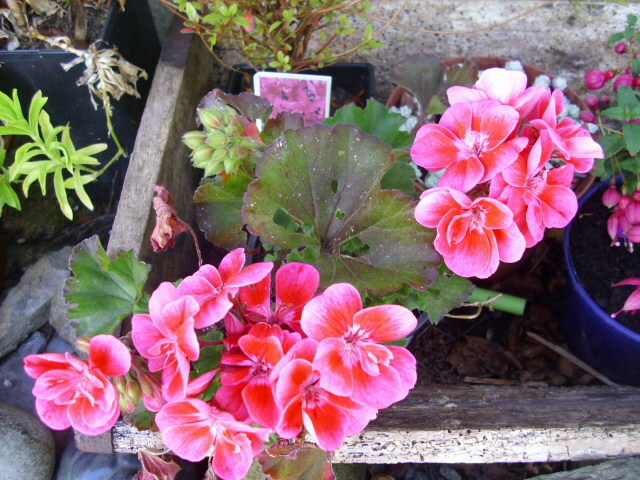 By the back door this lovely Geranium is flowering, I love the colour. Comfrey is a valuable plant @ Prospect Cottage. Comfrey is such a valuable crop for anyone growing organically, it is easy to grow and can be harvested up to 4 times a year. This barrowfull was harvested from only 3 plants.It will be used to make a liquid feed. Nettles are also added to the brew, this gives a perfectly balanced fertiliser for all crops. The taproot from Comfrey travels down about 10ft bringing valuable minerals to the upper soil levels and to the plant itself. 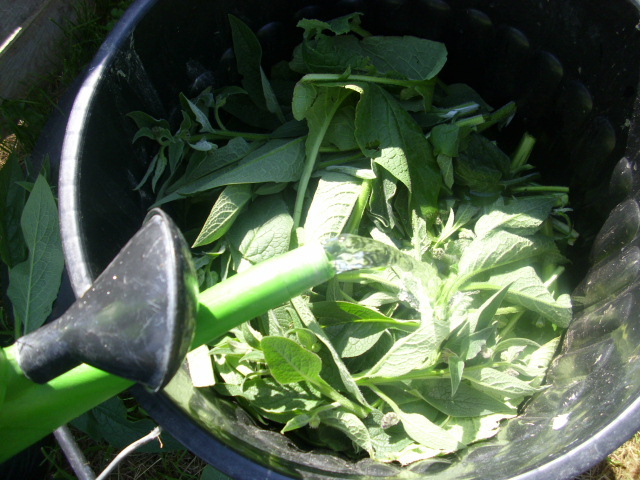 To make the feed put the chopped up leaves, comfrey and some nettles, into a black dustbin. A smaller container if you have a small garden. A black container is good as it holds the Sun’s heat helping the mix to break down quicker. Cover leaves with water, use a stick to push the leaves down. Cover and wait 2 to 3 weeks. A WARNING! Don’t put the container near the house as the mix will stink, especially so when agitated! DO place it in a sunny spot, it will break down quicker. Use to feed any plants that need a boost. Dilute until the colour of weak tea. I use it on all veg crops, about every 10 days throughout the growing season. 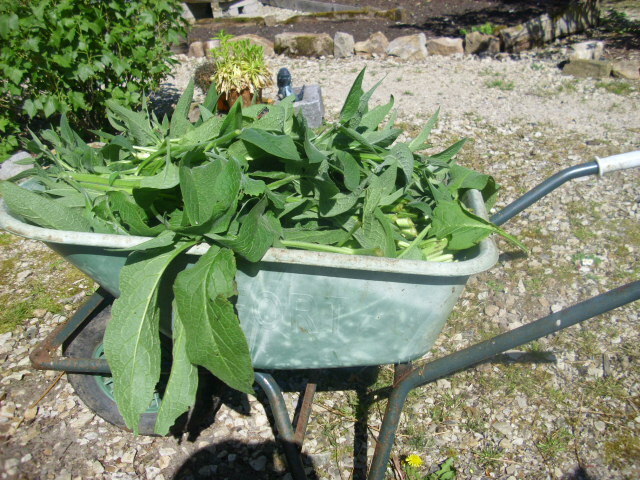 Another way to use Comfrey is “chop and drop.” This is a term most often used in permaculture. Comfrey is planted near the crop it is to be used on, chop down to about 3 inches and spread around the base of the plant. It will rot down quickly providing mulch and nutrition for the plant. 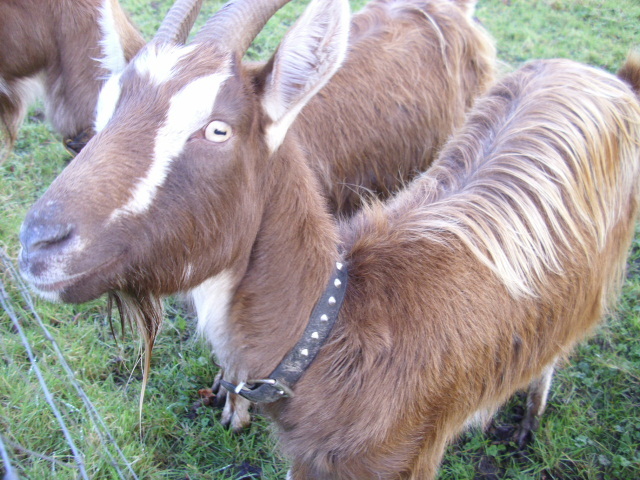 The variety we have is Bocking 14, developed by Lawrence D Hills in Bocking, Essex. This variety is very high in nutrients and sterile so it won’t spread like mad. Propogation is by root cuttings only. Production and growth @ Prospect Cottage. 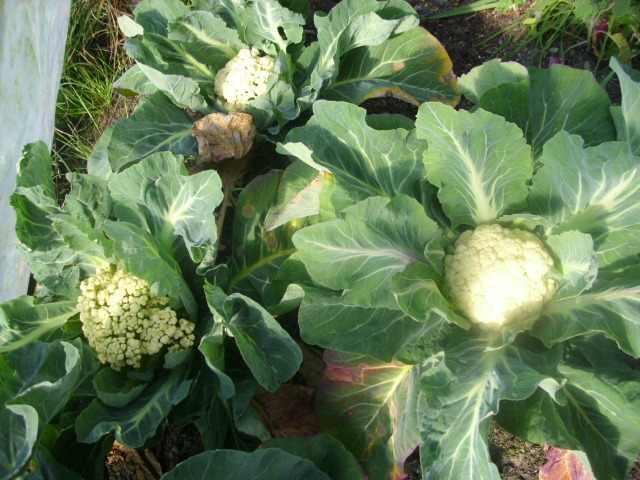 3 Cauliflowers ready for harvesting. There has been incredible growth in the last week. We were away from Tuesday to Saturday but it felt more like 2 weeks from the growth spurt that occured. Cauliflower to cook, cauliflower to freeze and more to come. 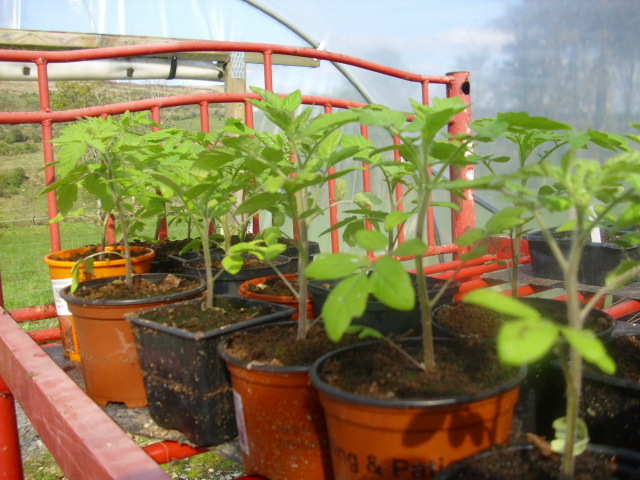 The Tomatoes are ready for planting out. I’m sure they grew a few inches last week! These will be planted in the small tunnel later in the week. They will be fed with farmyard manure, dug in under each plant at planting time, later when the first trusses have set they will get a weekly feed of a nettle and comfrey liquid fertiliser which we make ourselves. 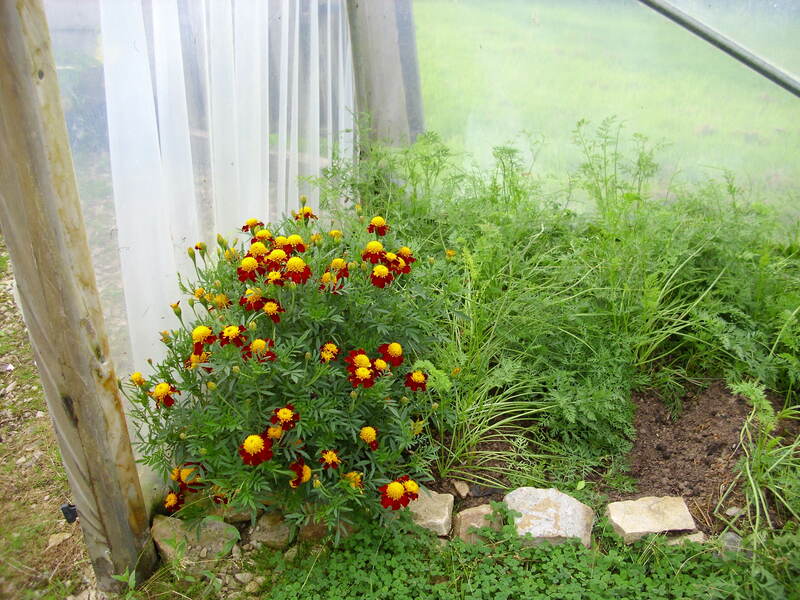 The farmyard manure as well as feeding the plant also helps to retain moisture. 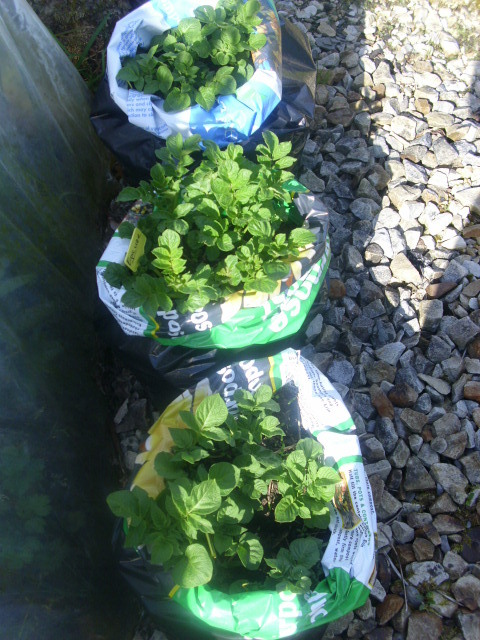 The Potatoes planted in sacks on St. Patrick’s Day have come on well. Today I will top up with more compost to encourage more Potatoes to form on the stems. 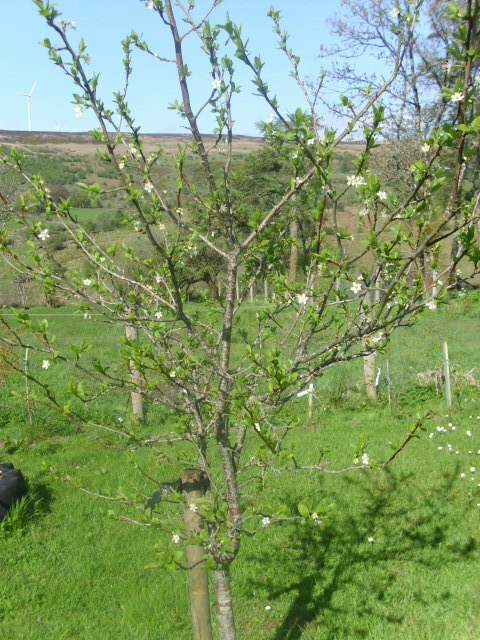 Yippee, at long last the Damson is flowering. 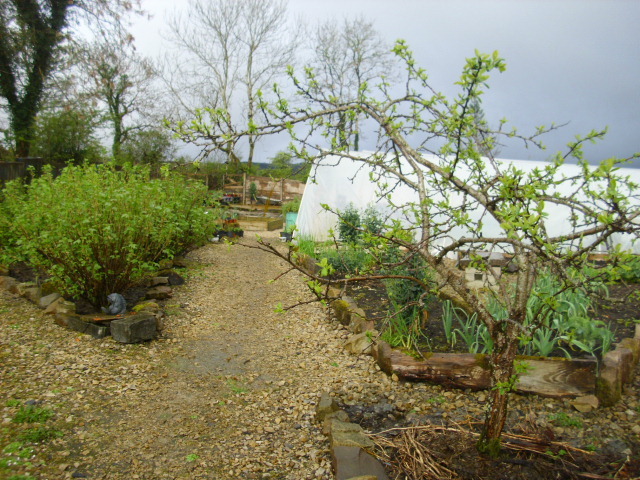 I’m really pleased about this as I grew this tree from a stone of a wild Damson which grows locally. That was about 6 years ago, so, yes, patience does pay off. Much more gratifying than buying a tree from the garden centre ready to go. This little tree I bought 2 years ago, it was just a whip. It is called Mrs Perry and I bought it on a visit to Irish Seed Savers in Clare. It is a self-rooter so I might take some cuttings from it in the Autumn. 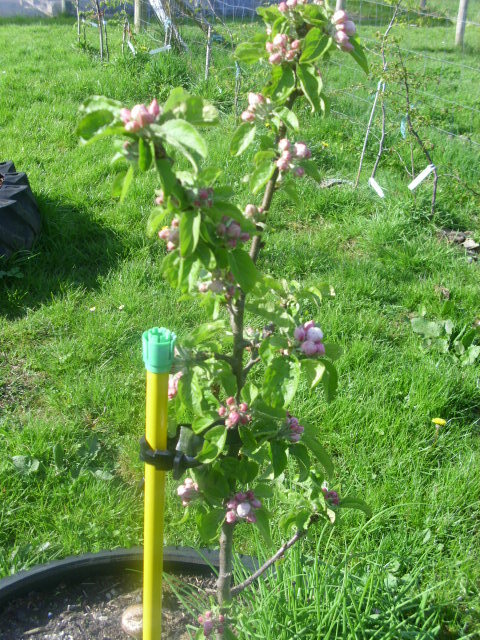 The fruit is dual-purpose and ripens in September, apples said to be very juicy and the tree is an abundant cropper.